The continent-nation of Australia is covered in deserts; named ones cover almost 1.4 million square km (over 500k square mi. ); taken together as a single desert it would be the fourth largest in the world and the second largest (after the Sahara) not counting the polar deserts. Most of the country's desert areas are to be found in the state of Western Australia, South Australia, and the Northern Territories. 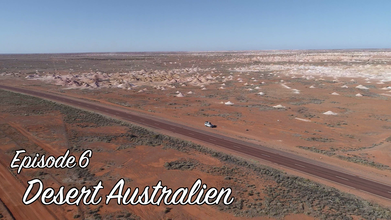 In this video by Falconskytech, you'll get a bird's eye view of a desert area in the Northern Territories.